One of the most comforting things that people need when dealing with a sports injury is perspective. To see their injury in a familiar light. I try to give my patients this everyday, by letting them know that I have experience dealing with their injury, and that the outcomes are successful. Sometimes listening to the 'expert' doesn't quite cut it. Wouldn't it have been nice when you suffered your sports injury to have had someone with the same injury tell you all about their own experiences? Maybe it would have eased your mind...and answered your questions...Maybe even given you a light at the end of the tunnel. 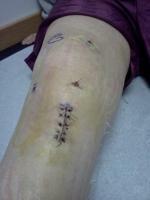 Allison's ACL Update (20 weeks later)... Please help! Question - What About The Knee?